So…we had hit our triple. Two interviews and a press conference. Tremendous. Plus we’d scored free tickets. A woman came down to the little reception room. I grabbed the tickets, turned down the hallway, headed to the turnstile…Nothin’. There was no one there. So we walked through. We took a left, headed down the concrete corridor. Two security guys came around the bend. We walked that way. Quickly. Down the hallway, a turn, another turn. I could see the sky as I looked up. Another turn. We were in the stands behind home plate. A few steps away was a gate with a security guard in front of it. We walked up and I before I even held up our passes, he opened the door. Utter insanity. 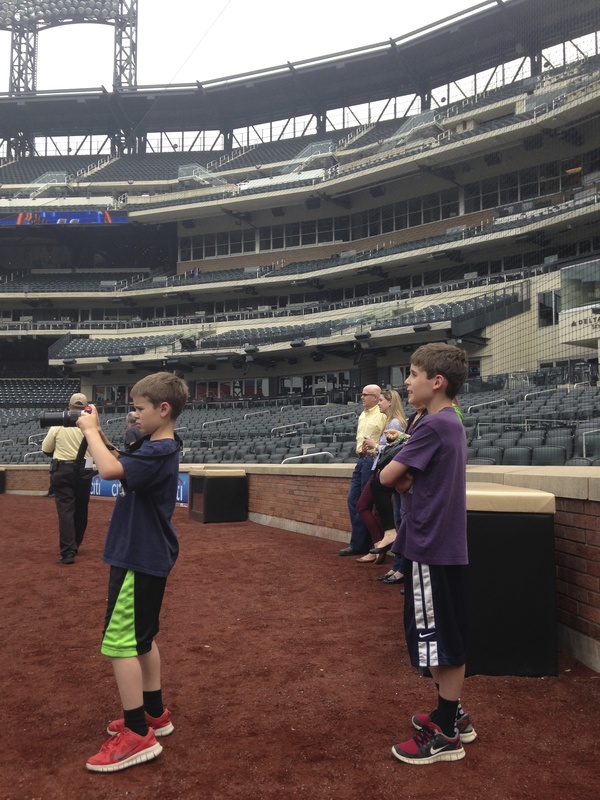 We were on Citi Field. Not in Citi Field – on Citi Field. 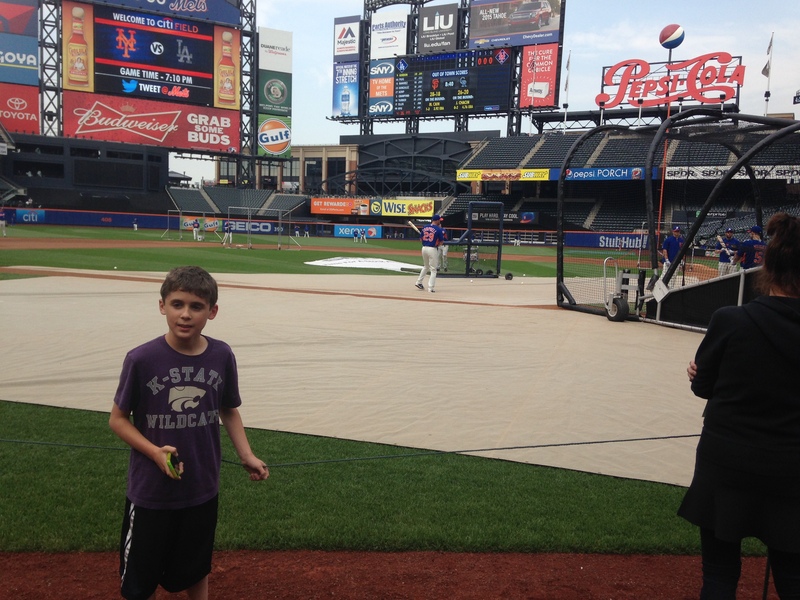 David Wright and David Murphy were 10 feet away taking batting practice. 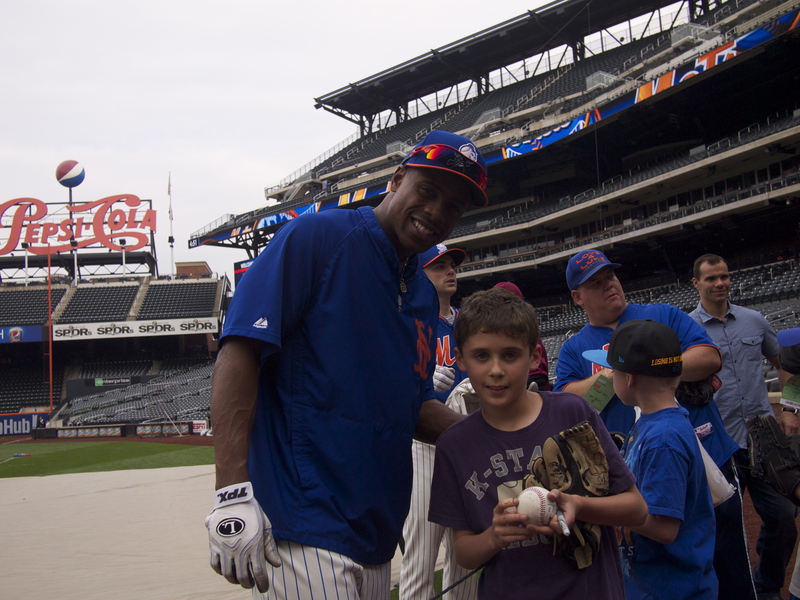 Curtis Granderson was stretching over to the left, not 20 feet away. Holy moly mackerel flaming shitballs. 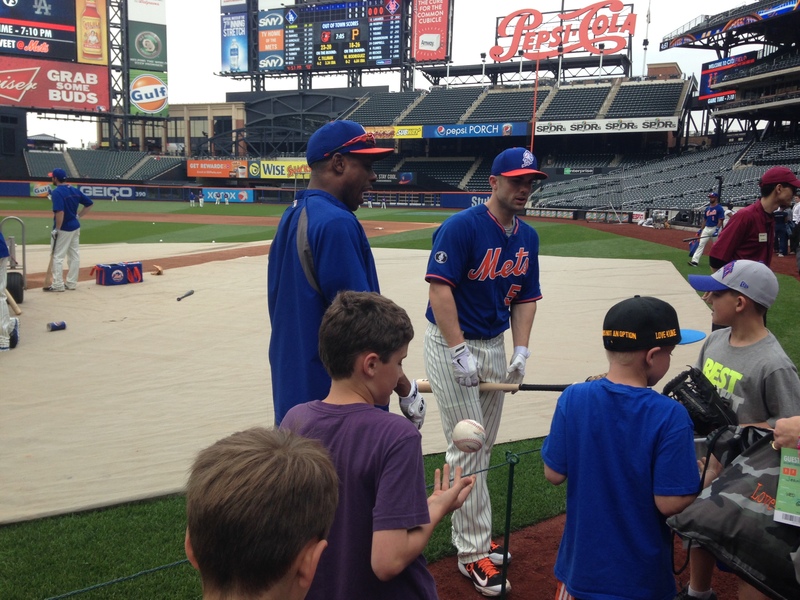 It was Mets, a security guard, and us. Baseball mutant, grade A. 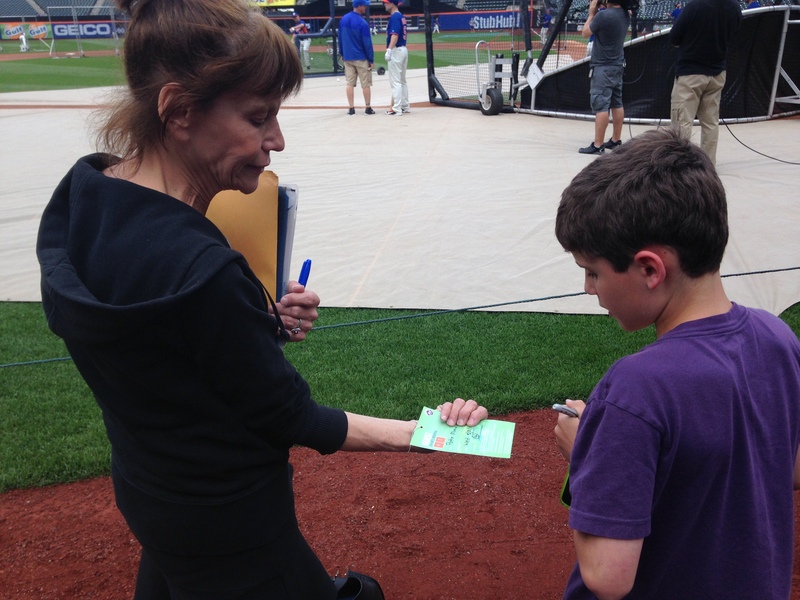 She knew the security guards and had a thick folder full of player photos. “Did you bring a Sharpie?” she asked Jack. 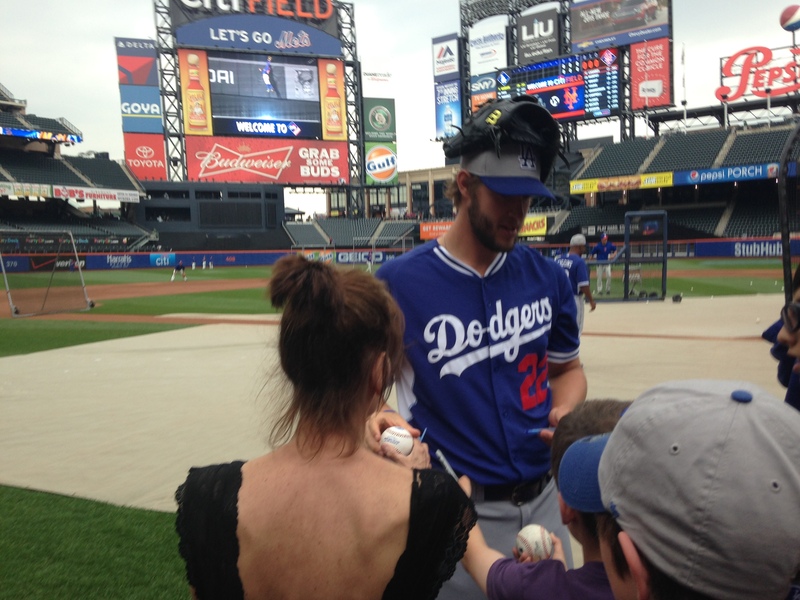 Creepy Autograph Lady knew when the yell and where to stand, but she wasn’t cute. 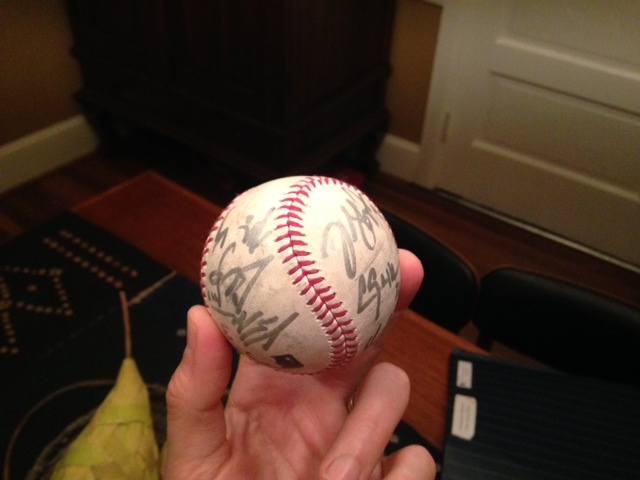 Ballplayers don’t have to come over to sign when she calls to them. But when a cute kid calls them…that’s a lot tougher to blow off. Together she and Jack made a brilliant team. Jack hit the Jackpot. 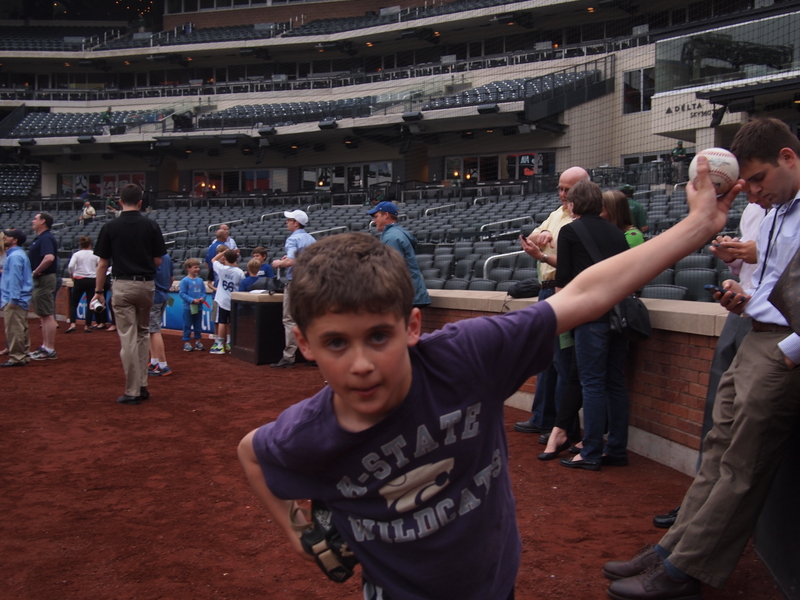 He got David Wright (Mets marquis 3rd baseman). 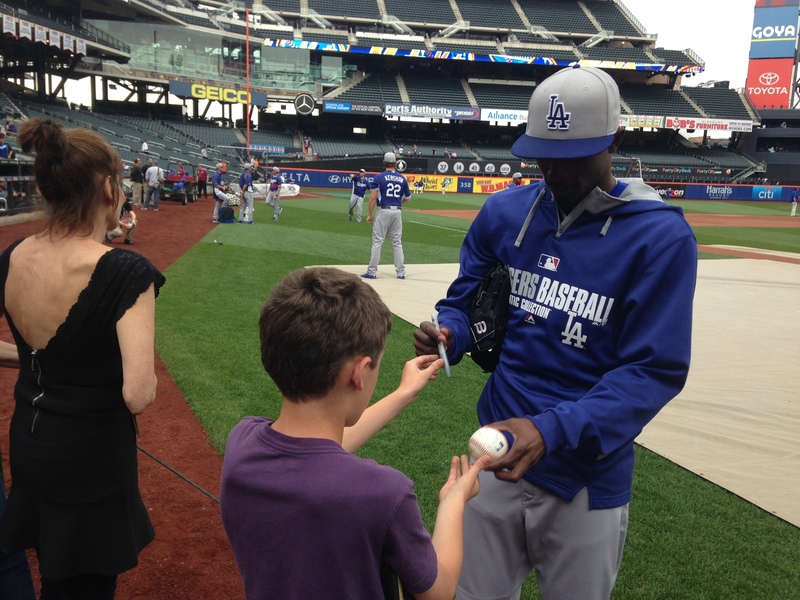 He got Curtis Granderson (former Yankee, just signed for 4 years/60 million). 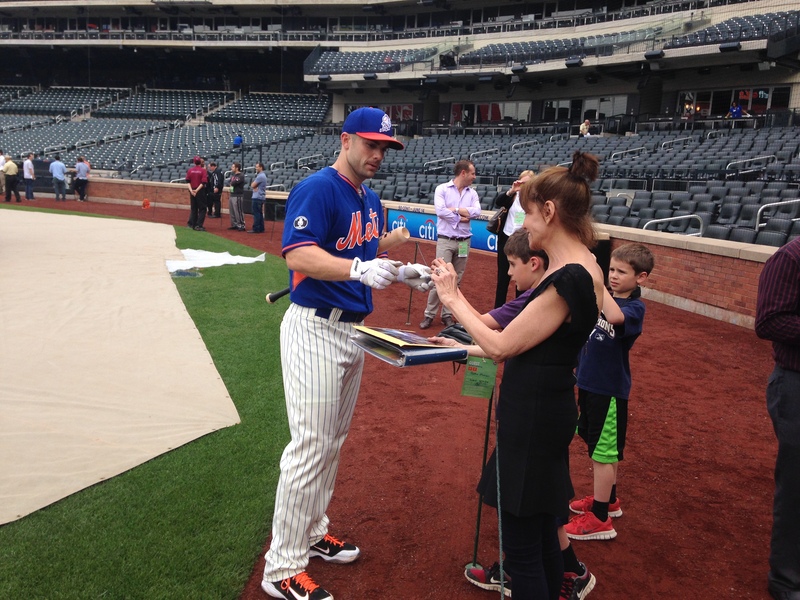 He got a solid 8 Mets players to sign his glove. They even gave him one of the balls. It was awesome. Then the Mets cleared out. 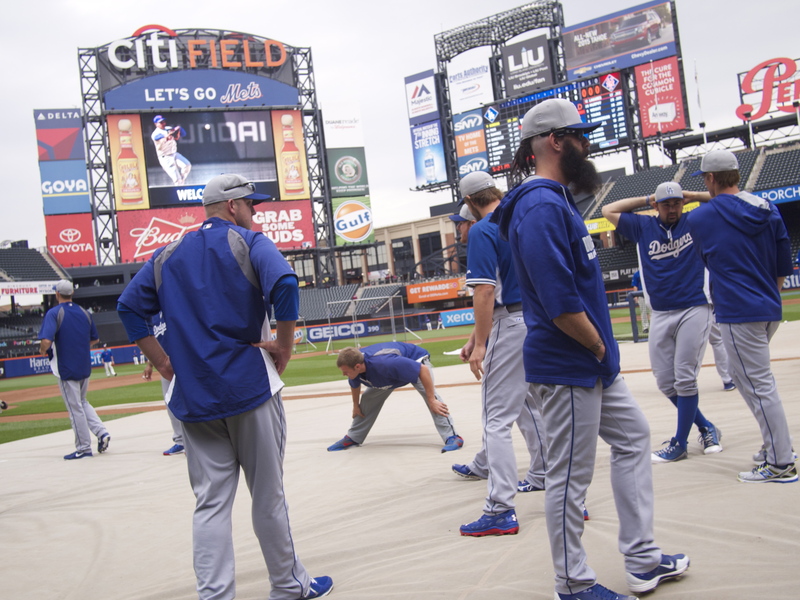 And then the Dodgers come out for batting practice. He got Clayton Kershaw (last year’s Cy Young Winner), Yasiel Puig (cover of Sport Illustrated), Adrian Gonzalez (leading NL in home runs), Hanley Ramirez, Justin Turner, you name it, he got ’em. 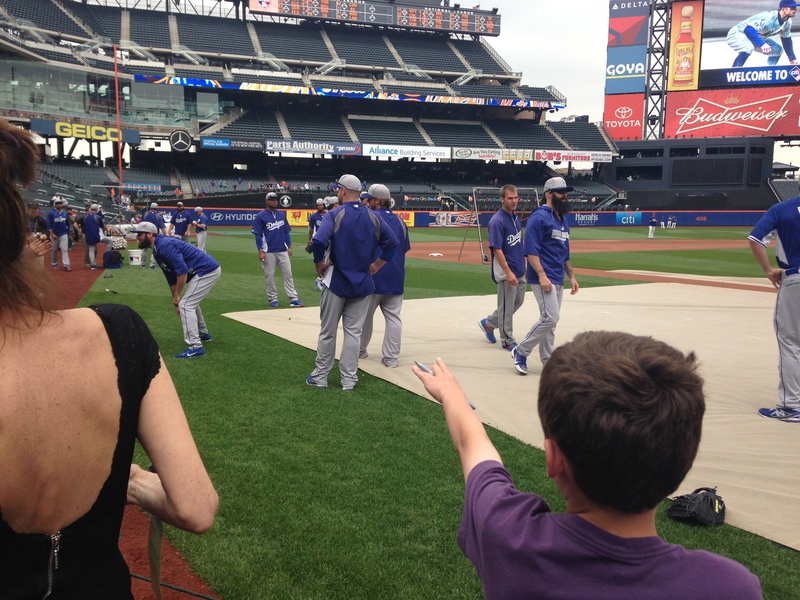 For 90 minutes in total we watched batting practice from just steps away. 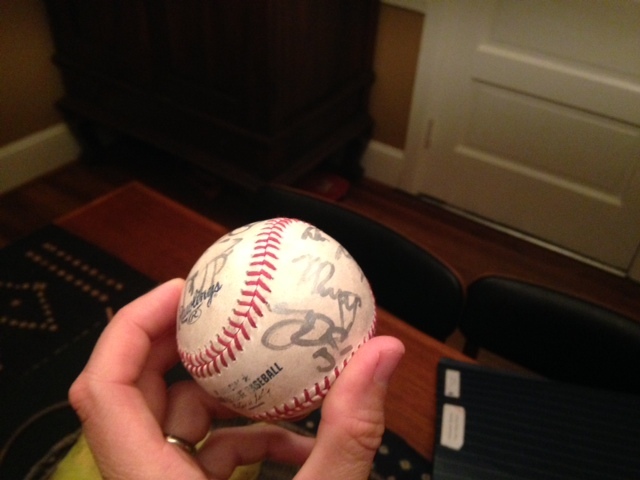 Beyond the autographs was just the majesty of what we were seeing. I remember seeing Hanley Ramirez hit shot after shot. There was the whack of the bat and then silence as the ball went on and on and on. It would go so far you literally couldn’t hear it as it bounced around in the black part of center field. It made me think of watching ski-jumping. You just can’t believe how long they’re in the air and a little piece of your heart is in the air the whole time with them. Imagine being at the driving range with Tiger Woods watching him drill balls. Or sitting with Van Halen while they tune up their guitars before a concert. We walked out slowly and in a bit of a daze. Then Alex broke the silence. Truly amazing. You guys rock!